It’s not hard to see why our guests fall very deeply in love with this glorious corner of Africa – and now they can make it part of their life-history, celebrating their wedding at the gazebo overlooking the Nagle Dam. Enjoy a wonderful outdoor event, like high-profile gospel star Sgwili did when he married at Nagle Dam and Game Reserve. Or choose to move on to our pretty thatched conference centre as the venue for your exclusive wedding reception. More options include the bridal party enjoying the accommodation at our exclusive Nagle Lodge, while your wedding guests are accommodated at other facilities in the reserve. Talk to us and we’re also happy to arrange add-on activities from game-drives and nature trails to boating and fishing for your guests. Step into your future as a married couple with a wedding in the beautiful setting of Albert Falls Dam, where the pretty Karkloof Hills sweep down to the glittering waters of this celebrated dam . . .
Gazebo, Albert Falls Dam and Game Reserve: Celebrate your morning wedding or a small party with a lovely view across the reserve. This gazebo accommodates up to 40 guests. Hall, Albert Falls Dam and Game Reserve: This well-equipped and popular hall accommodates up to 250 guests. It comes fully equipped with 20 round tables and 200 chairs. 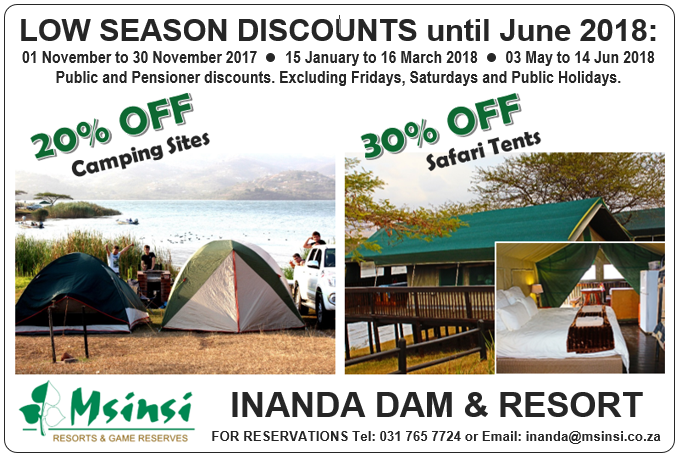 Talk to us about a demarcated area to erect a marquee in the reserves – bring your own marquee or hire one through Msinsi Resorts and Game Reserves. Our marquee accommodates 200 guests and comes complete with tables and chairs. Other options include a waterside marquee in Albert Falls – or you could consider the gazebo at our sister resort, Bon Accorde.